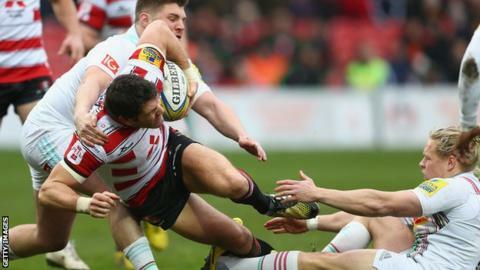 Gloucester eased past Harlequins to record successive Premiership wins for the first time this season. The hosts led 23-6 at the break, James Hook scoring the game's first try and converting Ben Morgan's effort as he contributed 18 first-half points. Nick Evans slotted Quins' only points before the break, but failed to emerge after the interval because of injury. Steve McColl slid over late on as Gloucester made it four wins in five games in all competitions. Defeat for a weakened Quins side, with Mike Brown and Chris Robshaw among five England internationals lining up against Italy in the Six Nations on Sunday, saw the Londoners miss the chance to go third in the table. Gloucester, who only have Scotland's Greig Laidlaw in Six Nations action this weekend, move up to seventh in the Premiership standings, with Wasps capable of swapping from eighth back up to fifth on Sunday if they overcome league leaders Saracens. The Cherry and Whites made a scintillating start, with Charlie Sharples collecting Evans' kick-off before racing clear and sending a dangerous chip kick through for Marland Yarde to defuse. It eventually led to Hook going over inside three minutes, with the fly-half converting his own score. Hook and Evans traded penalties but, as Quins' looked to compose themselves after Gloucester's fast start, Ross Chisholm was sin-binned on 16 minutes. Some slick play from Willi Heinz, Matt Kvesic and Sharples, following a period of unrelenting pressure by the hosts, saw Morgan go over before the break. While both sides threatened after the interval, it was not until four minutes from time that McColl slid in for the final score, finishing off a fine team effort that started with a Harlequins turnover following some fierce defending from the hosts. "It was a fantastic performance. I thought we were comprehensive winners. "The risk of coming into this week's game, on the back of the emotion of the Bath win last week, was how we would respond to a different week. "Charlie Sharples set the tone right from the first kick-off with that lift and the energy we brought to the first half was superb. The result was, though, built on our defence." "Gloucester were better in every facet of the game on the day. We were thoroughly beaten. I was delighted to see the fight in the team, that they did not just fold. "They played a much better way in the second half than they did in the first half but, at that stage, the game was done. "We have to dust ourselves down and say we will never play like we did in the first half again, but credit to David and the Gloucester team, they were fantastic. "But you look at yourselves and we are just thoroughly hacked off by the way we played." Gloucester: Burns; Sharples, Meakes, Twelvetrees (capt), McColl; Hook, Heinz; McAllister, Hibbard, Afoa; Savage, Galarza, Kalamafoni, Kvesic, Morgan. Replacements: Lindsay, Murphy, Doran-Jones, Thrush, Rowan, Braley, Atkinson, Cook. Harlequins: R Chisholm; Yarde, Hopper, Sloan, Visser; N Evans (capt), Tebaldi; Lambert, Gray, Sinckler, Merrick, Horwill, Wallace, Ward, Luamanu. Replacements: J Chisholm, O Evans, Collier, Matthews, Botica, Waters, Stanley, Swiel.